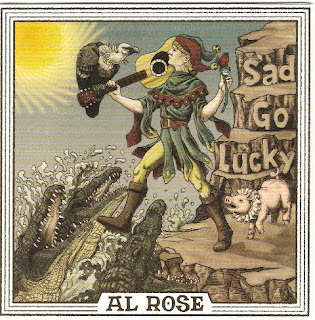 If you’re on the lookout for music that is the total antithesis of pop then the sixth album from Chicago based singer- songwriter Al Rose is perfectly designed to meet your needs. ‘Sad Go Lucky’ is a deep eclectic album that while being a touch indulgent has a sophisticated feel that will probably only have limited appeal outside connoisseurs of Americana music. However those listeners prepared to dig deep will reap the rewards from repeated plays with each listen being a voyage of discovery as you grasp the complexity of Rose’s song writing style. A quick glance to the homepage of Rose’s website will give you a flavour of his artistic pretentions with some iconic imagery of 20th Century American culture setting the scene for those exploring his work for the first time. This twelve track strong album contains plenty of five minute plus songs to test the stamina of a casual listener but his hard hitting and complex lyrics are expertly supported by the usual array of sounds that you will find on any Americana recording. Therefore don’t be surprised to hear the banjo, dobra and pedal steel featuring prominently alongside trombone, piano and cello. The soul of the album resides within the third track with Rose’s scathing attack on modern day culture where he spares the condemnation of no technological fad in ‘They Lowered the Bar Again’ along with the use of some colourful lyrics. The banjo gives a traditional country feel to ‘The Day Before the Infamy’ and ‘Scorpion Hills’, while there is a hint of Celtic influence to the opening and title track ‘Sad Go Lucky’. Perhaps the most curious and surprising track on the album is ‘Daddy Doncha Do Me’ where completely out of the blue, Rose launches into a three minutes toe tapping rock n’ roll tune that while being out of context on the album has an infectious quality that could see it added to an alternative playlist of upbeat feel good music. As if to reassure the listener that this is no throwaway pop record, Rose chooses to follow that up with the excellent country chill out track ‘On the Shelf’ before ultimately closing the album with the stamina testing eight minute piano-led ‘Sneaky Feelings’. The work of Al Rose is always going to be for specialist music lovers with an acquired taste but those prepared to take time out and give the album respect will be appreciative of the way he blends the traditional sounds with his acclaimed wordsmith qualities.